Chart from U.S. Census Bureau report shows changing trend in immigration. 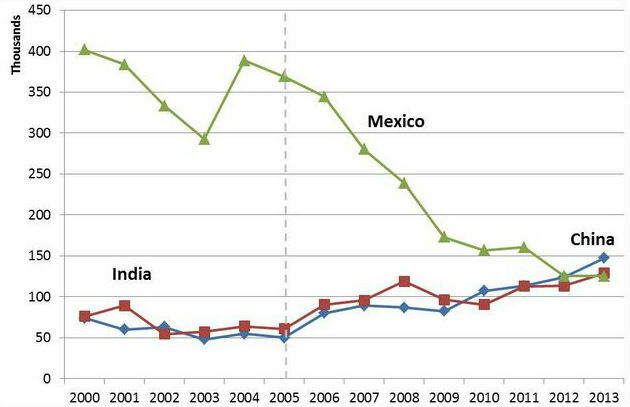 China and India have replaced Mexico as the main source of immigration into the United States, according to a new report released at a conference in San Diego. The report by a team from the U.S. Census Bureau was presented at Population Association of America‘s annual conference, which concluded last weekend at the Hilton San Diego Bayfront. “This new pattern in the national origins of recent immigrants marks a dramatic change from recent decades,” the authors wrote in an abstract.